I will be the first to admit that when I started offering these programs I was also uncertain if an online approach to healing would work (seriously, I was!). So I took a massive risk by shifting my expertise (over 20+ years) in private practice and teaching in-person groups, to the online world. And hands down one of the more commonly asked questions I get around SmartBody SmartMind and its effectiveness has to do with the fact that it’s online (and to be clear, ‘online’ also includes many live video conferencing lectures and Q&A sessions that can be accessed by phone or computer). This question makes a lot of sense since the main model for healing and getting help for most of us has been in private sessions, face-to-face, and so on. Now, four plus years later, with nearly 3000 participants from almost 60 countries having gone through the virtual hallways of my online curriculum, I’m SO glad I took that risk and started something that hadn’t been done before. 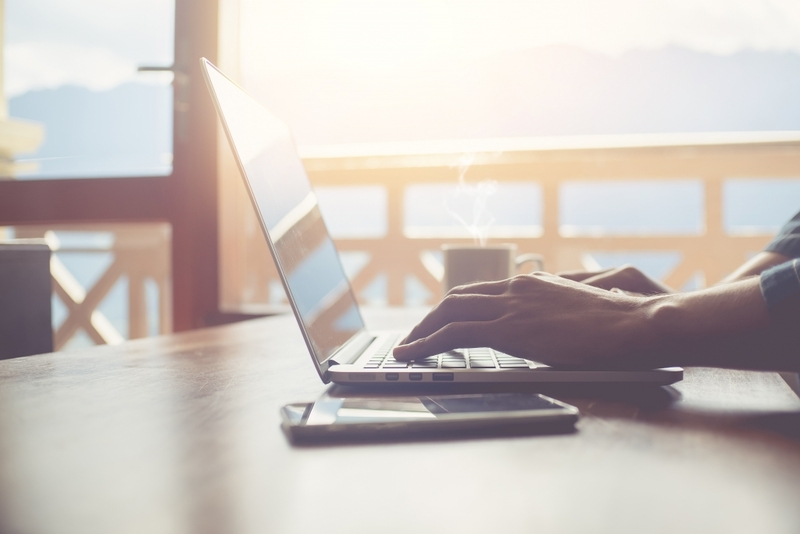 The bottom line: I learned that there are many valid reasons why online learning and healing can be highly effective for those with an early trauma history. Why ‘online’ can be a potent way to heal. Growing the feeling of cellular safety in the nervous system is KEY – not only to turning on our healing DNA, but also to getting more access to all those higher level human functions like focus, planning, purpose, creativity, connection and….we MUST talk directly to our physiology in specific ways to grow this sense of cellular safety, and we must do so repeatedly over time. It’s also important to know that we can’t build this sense of safety using only our intellect because the safety ‘setting’ lives in a more primitive, non-verbal part of our physiology. In knowing all this, it makes a lot of sense that online healing is so powerful. We can’t heal and learn on the ‘clock.’ By this I mean, we might have a therapy or bodywork session scheduled and sometimes such scheduled sessions don’t suit how our day, or week, turns out. We might need to cancel, rush, or not have the right amount of time post-session to integrate and fully take in the effects of the work. By having access to online learning and experiential lessons we can structure our learning and practice to suit OUR schedules. And if need be, we can tweak and adapt our practice at any time. You also get to do it in your space, at your pace. So it is highly adaptable to the needs of your system and your life. With early trauma, we get mixed signals about whether connecting with other people is safe, and often our system reads this connection as a threat. And being with others can be highly activating to the nervous system. When we learn online, we have the ability to connect in a way that allows for physical distance while also allowing for connection. There are many opportunities for connection in SmartBody SmartMind, and we get to choose how and when and to what extent we want to connect, allowing this to grow and change over time. Over time, this gives us more space and support to both grow that foundational safety in the system, and to grow our access to the social engagement part of the nervous system as well. One of the hallmarks of early and developmental traumatic stress is feeling uncomfortable and downright frightened being seen. As well as being put ‘on the spot’ by someone who we might consider a ‘superior.’ While a healthy client-practitioner relationship should not bring in early parental dynamics, it is hard to steer fully clear of this, and just navigating the subtleties of this is an art in itself. Many of our alumni have found that doing the practical neurosensory exercises solo and in the comfort of their own home means that they don’t have to protect and guard to the degree that they might, often unconsciously, when in a private session. If you haven’t yet, be sure to watch the 5 minute video I have on our SmartBody SmartMind registration page (it’s near the top). I mention this because I describe why it was important for me to put this online program together. In a nutshell, it was because the amount of time needed to teach, repeat, and review the science of our stress responses, how trauma is trapped, what must happen for it to release, and also teach people how to re-connect and feel their internal biology took a LOT of time. It was not time efficient, and certainly not cost effective for my clients to sit with me each week to learn the science and the practices that could be done with well designed video lectures and audio lessons. To be honest, even if they did come in each week it would still not be enough. Having an online platform that one can access 24/7 in their own time, every day, or every other day and so on, greatly supports the ability to create lasting change and build foundations that can foster optimal health and healing. While there are more benefits to online learning and healing I’ll leave it to these main points for now. I fully believe in technology and using it for the good of humanity, and if we can learn about the intricacies of the nervous system and heal trauma at the deepest level possible in this remarkable manner then why not, right? Final point that you should know – this online learning and healing environment does not replace good private work you might do with a counsellor, bodyworker and the like. I advocate that people find the other practices and therapies that suit them and compliment this online world. What we’ve found, and I speak about this in that video at the top of the registration page, is that those who get the learning and practice within SmartBody SmartMind on board and into their system, will find that private and group class work become that much more potent. We run SmartBody SmartMind once a year and you can learn more about it here. PS Sometimes it helps to hear from someone who’s “been there and done that” like Amy has. 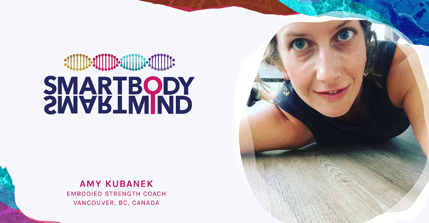 She’s an embodied strength coach from Vancouver, BC., and she had HUGE doubts that healing online could truly work. She really did! The first time I spoke with her, she even said that she didn’t think it would work! How’s that for honesty. You can listen to that first chat here. At the 3 minute mark she speaks to the power of this method of learning and healing BEING online).